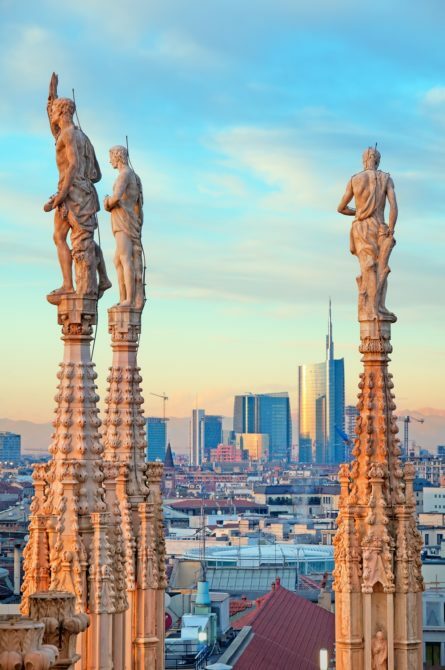 A private Milan overview tour, starting with the world-famous Duomo and terminating at Milan’s opulent opera house, La Scala. Often unnecessarily overlooked in favor of Italy’s so-called “grander” cities, Milan shouldn’t be deemed any less worthy of a visit than, say, Rome or Florence. This private Milan overview tour with an English-speaking guide from Italy’s Best will take you to the city’s must-see sites. Your tour starts at the Duomo, the fifth largest cathedral in the world and the largest within Italy. An impressive Gothic masterpiece, the church took nearly six centuries to complete! Explore its stunning stained glass windows, beautiful artwork and sacred relics as your guide tells you the story of this magnificent structure. Weather permitting, visit the rooftop for a breathtaking view of the city. On a clear day, you can see the Alps! Next, visit the storied Galleria Vittorio Emanuele II – a 19th-century glass-vaulted arcade flanked with shops and cafes that houses an integral piece of fashion history: the original Prada store from 1913. While here, find the Turin Coat of Arms on the floor and spin on the bull to partake in an Italian superstition for good luck! Your guide will be happy to demonstrate proper form and show you exactly where to place your heel. Pass through the Galleria and find yourself in Piazza della Scala where stands the world-renowned La Scala Theater – Milan’s legendary opera house dating back to 1778. Still in use today, some of the world’s greatest musicians and singers have performed on its stage. Enter the La Scala museum to see instruments, ceramics, portraits, costumes and other items that are part of the theater’s iconic history, and then enter one of the boxes for a view of the theater, stage and orchestra pit! Next, take a stroll through the winding streets of the Brera District. The charming neighborhood’s historical buildings, cafes and shops have been a magnet for artists and intellectuals over the centuries. The serpentine streets bring you to Castello Sforzesco, a medieval castle and fortress belonging to the Sforza noble family. Admire the grounds as you learn about the castle’s enthralling history and evolution before continuing your walk to the elegant Magenta neighborhood. Don’t forget to people watch along the way to see first-hand why Milan easily rivals Paris as the world’s most fashionable city! Following your Milan overview tour, we can arrange for a driver to bring you anywhere you wish, or your welcome to continue exploring this great city on your own by foot. Private tour with an English-speaking licensed guide who will help you explore Milan’s role as a fashion capital during this Milan fashion tour. During this private Venice orientation tour, visit Piazza di San Marco, the Doge's Palace and other highlights of the lagoon. This Florence night tour is based on the traditional evening passeggiata. Get an overview of the historical center and visit the Piazza del Duomo. During your private Milan food tour, led by a culinary expert, you will explore the Brera district & learn the sweet & savory dishes that make Milan unique. During this full day Barolo wine tour your driver will bring you to two wineries where an expert guide will lead your through tastings. This evening tour of Rome by car will allow you to see the Eternal City in its splendour. Your driver will provide you with a panorama of Rome’s top sites. Tour the romantic lake district just outside Milan during your Lake Como day trip. Fresh air & relaxation are on the agenda between visits to area villas. Explore the beauty and bohemian style of Milan in this Brera district stroll and Sforzesco Castle tour, led by an expert guide.